Three Korean artists are showcasing their works at one of the world’s largest and most prestigious contemporary art fairs held in Germany. It is the second time Korean artists have been invited to the Kassel Documenta since 1992 ― the festival has been taking place every five years since 1955. The three 40-something-year-old artists Moon Kyung-won, Jeon Joon-ho and Yang Haegue present innovative art forms that focus on social meanings. The art fair is considered the most innovative contemporary art platform, and invites over 150 renowned artists from 55 countries to Kassel, a city destroyed during World War II and revived as the major transportation and industrial hub of Germany. During the fair period which lasts 100 days from June 9 to Sept. 16, the whole city turns into a giant museum in which artworks are displayed in parks, museums and train stations. The team of Moon Kyung-won and Jeon Joon-ho, both 43, present artworks that shed light on social function and role of art through their “News from Nowhere” project consisting of three parts ― a film, installation and a publication. Moon and Jeon’s collaborative project starts with a film that shows the survival of two artists in a post-apocalyptic environment. Starring famous Korean actor and actress Lee Jung-jae and Lim Soo-jung, the 13-minute film “El Fin del Mundo” (The End of the World) depicts the last art form at the end of the world and the revival of art based on dialogue between two characters. “‘News from Nowhere’ works on the assumption that a major climate change endangers humanity’s survival. Through the two main characters, a man and a woman, the film asks questions about human beings who have to adapt to a new environment,” artists wrote on the website describing their artworks. “The questions about the future will, hopefully, lead to discourse and a series of thoughts surrounding life,” they said. Next to the screening room sits an installation titled “Voice of Metanoia,” the second part of the project. The collaborative piece made by 10 artists, designers and architects including Japanese designer Takram and Korean fashion designer Jung Kuho recreates a new lifestyle and products based on the fictional social system built in the film. The last part of the project is the book, a collection of interviews and records gathered during the project making. Yang Haegue, a Korean-born artist who is based in Seoul and Berlin, presented two projects ― an installation project that is placed at an abandoned train station and a stage performance with the distinguished French actress Jeanne Balibar. Yang installed a hanging, moving-blind installation, inspired by the industrialization that sprouted in the now abandoned old freight terminal in Kassel. 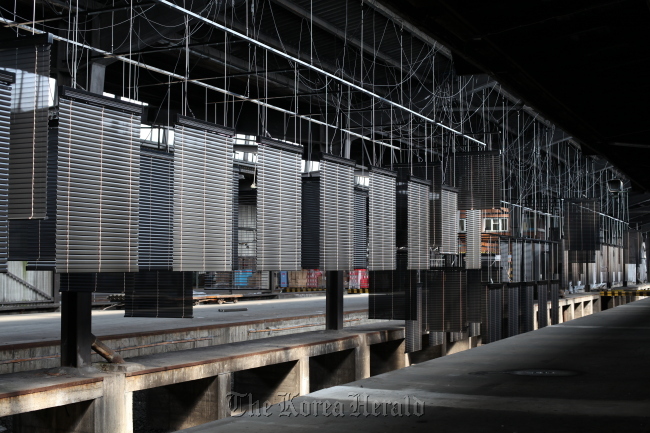 Through the installation consisting of 45-meter-long and 2-meter-wide black aluminum blinds, Yang tried to contemplate “the collective memory” of industrialization, which was also experienced by Koreans during the 1970s and 1980s. Through the train-like shape of the installation and movements of the blinds, Yang recreates the memory of industrialization in the deserted train station in the city which used to be an industrial and transportation hub. Yang also presented a stage performance during the art fair’s preview week on June 7 at a theater in Kassel. The exhibitions continue through Sept. 16.